I got food in my belly, a license for my telly and nothing’s gonna bring me down! We’ve only just caught on to this track, but you should have seen the shenanigans around the breakfast table down at the Harp Surgery this morning. The Good Doctor was blowing bass on an empty scrumpy jar, Elwood was harping his little head off, Otis the postman was tapping his teaspoon on the side of his cup and the Riverboat Captain was dancing a maniacal hornpipe around the hazardous waste container. We’ve not had so much fun since last Sunday’s matinée showing of Jungle Book. We hold our hands up and confess we know next to nothing about Paolo Nutini or his band The Vipers, except they’re from north of the border. Clearly Paolo has been a rising star for some time. For obvious reasons however, one player from amongst The Vipers caught our collective eye. He’s Fraser Speirs, the coolest Laird o’ the Moothie. This man has been a beacon for the diatonic for decades. You can see him in action here with Tam White. Anyway, we just had to share it with you. So turn up your sound system, grab your G major diatonic (2nd position) and get with the groove! Happy Harping. And by the way… in case you were wondering, it’s here. And yes he does the Bear Necessities too! For more information on this track and the harmonica content, see our follow up post Pencil Full Of Lead – Which Harmonica? Always nice to ‘discover’ things, places and people you never knew you never knew. That were there all the time. Your hornpipe is coming on nicely too! I remember seeing Paolo Nutini debut at the 2006 Montreux Jazz Festival, just before These Streets was released. He mumbled a very modest, “Hellooo, oim Paolo Noootini,” half-heartedly brushed a curtain of hair from his eyes, and launched into a pretty bitching version of New Shoes. As a professional fiddler of expense accounts, occasional music journalist, I was utterly delighted to make his acquaintance. Pop shouldn’t be this much fun. Looks like the lad is maturing nicely. Well found, Wilf! Is that a tongue-blocking smiley? 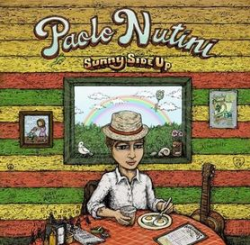 I’ve been trying to figure out the Paolo Nutini track and new it was a G harp, but is it a high G harp? I have been checking and re-checking this and I think you must be right. Most of his licks are available on a C major harp in 3rd position, which carries you into the same register, but the feel is not the same as you’d get on a high G in 2nd position. I think the give away is the last phrase in the harp solo as the vocals resume. It clearly ends with a full draw bend in hole 2 [4B 4D 2D 2D”..2D]. The same phrase can be produced in 3rd on a C major harp as I mention [6B 5D 4D 4B.. 4D], but it’s not quite true to what we’re hearing. So, subject to a reply from Mr Speirs, it must be a high G major harp in 2nd position. Looks like we done got ourselves the anwer from Fraser Speirs himself. Check out out follow up article http://www.harpsurgery.com/wp-admin/post.php?action=edit&post=2831 . I got money in the meter and a two bar heater…. Enjoy! All good stuff as usual. what would be really useful would be to play this – or any other tune you are trying to learn – through a slowdown program. Are there any free ones you would recommend? Others might recommend a programme called The Amazing Slowdowner, which is $49.99. Audacity is free, so it wins my vote. The Amazing Slowdowner is brilliant. Thoroughly recommend it. hi i have just nailed single notes on harmonicas how does the harmonica get the leee sound in the start of the song because i cant do it hope to hear from you soon scott. Hi Scott. I’ve been trying and trying to hear what you mean by the leee sound. Can you help me out here?